Injection wells are installed via direct push or sonic drilling methods, and are constructed with materials that are compatible with all of the reagents we utilize. 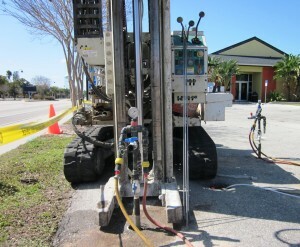 Permanent injection wells provide the ability to monitor groundwater at adjacent locations to determine if the appropriate conditions have been established and that oxidant has permeated throughout the entire site. They allow for real time treatment modifications based on daily groundwater sampling from the injection well locations, and can remain in the ground post-treatment and can be used as locations for additional oxidants or biological enhancing materials in the future. To target the vertical interval, Geo-Cleanse selects an appropriate screen size and number of injection wells per borehole depending on the geology present and the size of the vertical impacts. Temporary injection wells are typically installed via direct push technology, and the reagent is applied by exposing the target vertical treatment interval. Depending on the site conditions, this application may be more cost effective. However, if multiple applications are anticipated then temporary wells are usually not recommended due to cost and technical issues. The installation of vent wells are only required for the application of catalyzed hydrogen peroxide. These vent wells are used to direct the flow of offgases produced from the oxidation process. The vent wells are constructed with Schedule 80, CVPC screen and riser, and also can be completed as stick-ups or flush mounts. 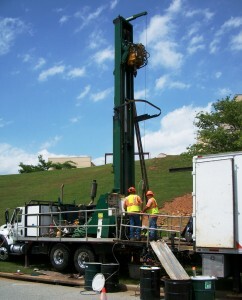 The vent wells also provide additional monitoring locations to observe the progress of the injection. Vent wells are typically screened from approximately 3 feet below ground surface (ft bgs) to the total depth of the vertical treatment interval. 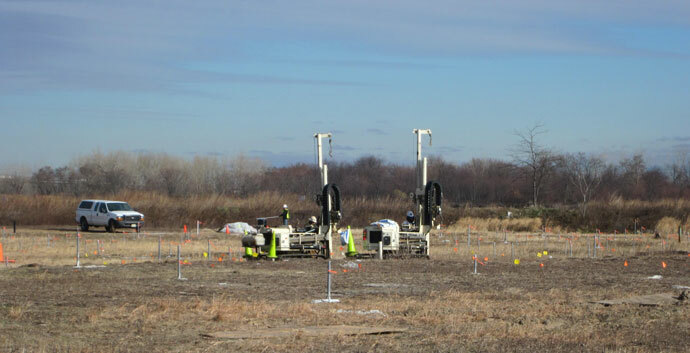 In-situ soil mixing is an effective, on-site remediation technology that provides efficient and uniform delivery of reagents. This application is selected based on the depth of contamination, the soil matrix, and the remedial goals. Soil mixing is most commonly applied with activated persulfate and potassium/sodium permanganate. Slurry emplacement is a process in which a fluid is introduced at a pressure sufficient to overcome the in-situ confining stress and the material strength of the solid matrix, causing the surrounding soil or rock to mechanically separate while inducing or enhancing fluid flow into the formation. Continued introduction of the fluid propagates the separation to a designed size. 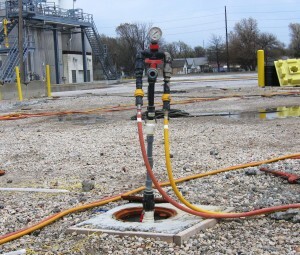 In remediation applications the emplacement fluid commonly includes a proppant such as sand to introduce a high-permeability medium into the target zone. This preserves the induced separation to retain permeability and not collapse after the injection pressure is released. Alternatively, the emplacement fluid could be used to transport granular solids that have remedial capability, establishing in-situ treatment zones such as permeable reactive barriers.